Click on the social media links below to be taken directly to our pages on Facebook, Twitter and Google+. "Like" us / subscribe to feeds to your mobile device/s and never miss a new ad or update from Australia's most popular canine website! As you can particularly see from the Facebook Feed (or if you go to our FB Page directly), we have a huge number of visitors who frequent that Page and receive a Feed of every ad placed on our site, direct to their Mobile News Feed. 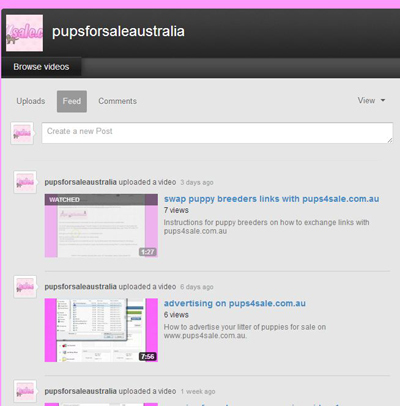 That means each time you place an ad for a litter of pups on our site, within 10 minutes it is being advertised throughout Australia not only on our site, but also to Facebook's huge audience as well. Additionally, if you share the Post of your ad on your own Timeline, it will automatically appear n the News Feed of all your FB Friends, widening the audience even further of potential new owners of your pups. 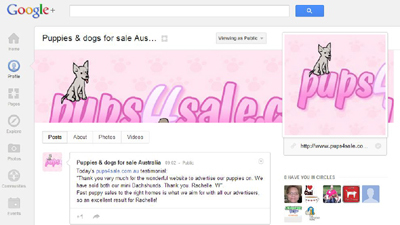 Pups4sale is the ONLY puppy classified website in Australia to offer such a great social media service, so why not take advantage of it, as have many thousands of other Australians! Follow us on Google+ by clicking the below screenshot to be taken to our Google+ page and place us in your Circle! Subscribe to our YouTube Channel where every important development or update on our site is uploaded on video! Click on the below screenshot to be taken to our YouTube Channel and "Subscribe"! "Follow" us on Pinterest by clicking on the "See on Pinterest" tab below and never miss a photo update!